Learn web development with Swift, using Vapor and Kitura. In this Docker tutorial, you’ll learn Docker vocabulary and the commands for creating, inspecting and removing containers, networks and data volumes. You’ll learn how to run Docker containers in the background or foreground, and switch between the two; how to publish ports; how to connect a database app and a web app running in separate containers; and how to share directories between containers and your Mac and among containers. 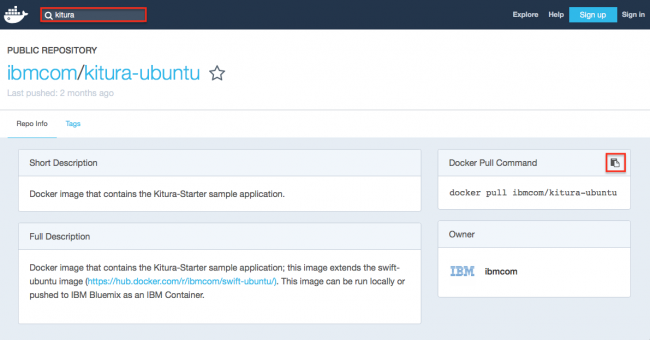 Docker is a tool that makes it easy to run applications in containers. Containers provide isolation and security like virtual machines, but they’re much smaller because they run in the host machine’s system. As an iOS developer, why would you want to use Docker? To avoid version problems — to run versions of operating systems, programming languages, database apps, web apps and web servers, machine learning programs — all in isolated environments, to avoid side effects from whatever else you’ve installed on your Mac. Basically, to join the ranks of it-works-on-my-machine developers! In this tutorial, you’ll get comfortable with Docker vocabulary and commands for creating, inspecting and removing containers, networks and data volumes. You’ll learn how to run Docker containers in the background or foreground, and switch between the two; how to publish ports; how to connect a database app and a web app running in separate containers; and how to share directories between containers and your Mac, and among containers. After completing this tutorial, you’ll be well on your way to Docker ninjadom! Note: This Docker tutorial assumes you’re willing to enter Unix commands in Terminal. Some familiarity with Unix commands and file paths, database apps and localhost ports will be helpful. Click the Download Materials button at the top or bottom of this tutorial to get the project files you’ll use to build the web server app, later in this tutorial. Docker was originally developed for Linux. Running Docker on macOS used to be pretty complicated, but a native macOS app Docker for Mac launched in July 2016, so now it’s a breeze! Note: If the direct download link above doesn’t work, go to Docker’s web page, click the Please Login to Download button, create an account, then wait for the activation email. While you wait, use the online Play-With-Docker playground. In this section, you’ll learn some Docker vocabulary and get comfortable with using the Unix command line for basic housekeeping tasks. Note: There’s a handy list of all the commands in this tutorial — scroll down to the end. The workhorse Docker command is docker run, and this is the simplest docker run command — it specifies the Docker image to run. If the image is not on your host system, it tries to pull it from the default Docker image registry. The meaning of the word image is similar to the disk images you download as .dmg files. A Docker image is an app, and you run it on your system in a Docker container. Although you only asked for hello-world, Docker looked for hello-world:latest — latest is a tag indicating the version. If you don’t ask for a specific version, Docker assumes you want the latest version. Because the image isn’t on your system, Docker pulls it from library/hello-world — its location in the default image registry Docker Hub. You’ll visit this place in the Running a Web App section. The Docker client and Docker daemon are parts of the Docker Engine, which is the client-server application now running on your Mac. The daemon is the server, and the client is the docker command line interface (CLI). The client gives instructions to the daemon using the engine’s REST API. Note: You’ll learn about Docker’s network and data volume features later in this tutorial. OS: mostly Linux flavors like Ubuntu, Alpine etc. programming languages: Swift, Ruby, PHP, Haskell, Python, Java, Golang etc. databases: MySQL, CouchDB, PostgreSQL, Oracle, IBM Db2 etc. application frameworks: Node.js, Flask, Kitura, Tomcat etc. web servers: Nginx, Apache etc. 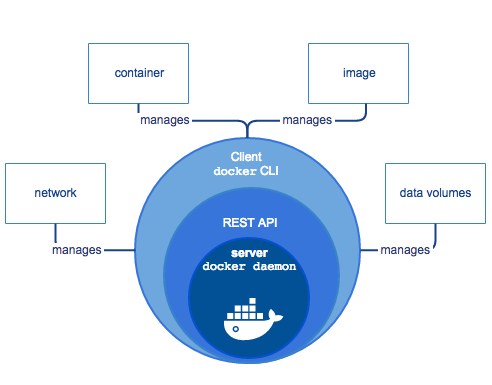 A Docker image consists of layers — lower layers (OS or programming language) are used by higher layers (API or app). Running an image creates a container — a thin read-write layer on top of the read-only layers of the image. You can run the same image in multiple containers using very little memory. Each container is just the read-write layer, and only one copy of the image exists on your system. The image’s top read-only layer specifies the command to run in the container — for hello-world, this command just outputs the Hello from Docker! message. Now to the housekeeping part — you need to keep track of what Docker is creating on your system, so you can remove stuff when you don’t need it anymore. First, some general information about the Docker command line interface (CLI) syntax: Docker commands are similar to Unix commands, but they start with “docker”, like docker run, docker image, docker container, docker network. Most commands have several options, and many options have shorthand versions. The full name of the option is --something, with two dashes, like --name or --publish. The shorthand version is -abbrev, with one dash, like -p for --publish or -v for --volume. A few options, like --name, don’t have a shorthand version. Most options require values, like -p 8080:8080 or --name kitura. A few don’t have values, and can be run together, like -it or -ti, short for --interactive --tty. You must specify an option’s value right after the option name, but options and option-value pairs can appear in any order. Many option values map something on the host machine to something in the container. In your case, the host machine is your Mac. You’ll use all of these, and more, in this tutorial. Note: Your output will show different IMAGE ID and CREATED values. As the output of docker run hello-world says, the Docker daemon created a container from this image, to run the executable that produced the output. Note: This does the same thing as docker container ls -a. For both commands, leaving off the -a option lists only containers that are running. Docker created an ID and a name for the container — your values will be different. Although the container exited, it’s still on your system. Note: Use the Up Arrow and Down Arrow keys to navigate through the Unix commands you’ve run in this terminal window. docker: Error response from daemon: Conflict. The container name "/helloWorld"
remove (or rename) that container to be able to reuse that name. This command first runs the part inside $(), to get the list of IDs for exited containers, then removes them all — brilliant! Time saver Tip — Docker cleanup terminal window: Move this terminal window to a corner of your desktop, and use it only for running Docker cleanup commands. This way, the command you want will be only a few Up Arrow keystrokes away. Another trick is to enter the Unix command history to find the number of the command you want, then run that command again by entering !. For example, below are the last few commands in my history, so entering the command !18 will remove all exited containers. Many iOS apps communicate with a web server, which is also the back end of a web app. And you often want interactions with the iOS app to be reflected in the web app, and vice versa. You can run the web app locally without containers, but running it in containers can make it easier to test different configurations in isolation, or to test user types with different privileges. To run a web app in a container, the first thing you need to learn is how to access the container’s ports in your browser’s localhost. The Docker term is publishing ports. In this section, you’ll learn about publishing ports, and also take a quick look at the default Docker image registry Docker Hub. Actually, you don’t need artificial intelligence to figure out ports! The syntax is --publish followed by two port numbers, separated by a colon. The trick is remembering the first value is for the host here, and the second value is for the container there — you’re publishing a port here from there. For the first number — the host’s port — you can specify any number you like, but the easiest option is to use the same number as the container’s port. For the second number, you’re stuck with whatever the container exposes — you’ll get an error if you try to change it. The ability to publish the container’s port to different localhost ports makes it easy to run several web app containers at the same time. Open a new terminal window — this will be your Docker run terminal window. Sometimes, you’ll run a process in the foreground in this window, so you won’t be able to run any housekeeping commands in it. That’s where your Docker cleanup window will come in handy! 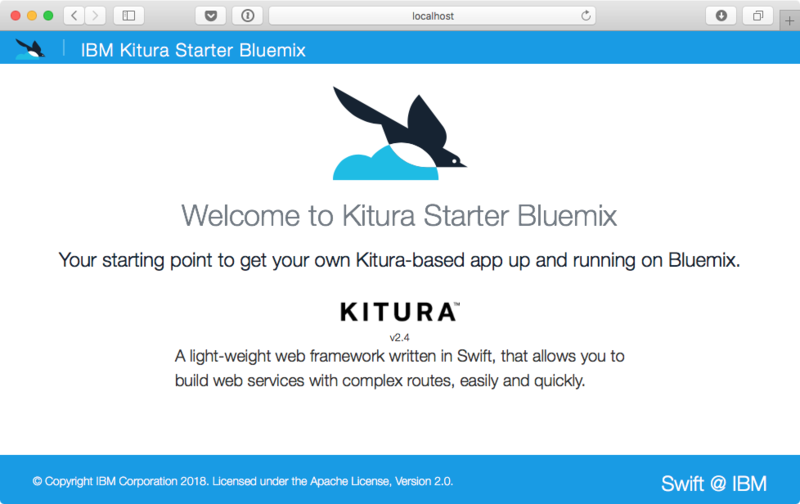 The ibmcom/kitura-ubuntu image layers a simple web app onto the Kitura application framework, which is layered onto the swift-ubuntu image, which is the Swift programming language layered on top of the Ubuntu operating system. Ubuntu is a version of Linux. Note: You could’ve just entered the command docker run ibmcom/kitura-ubuntu, instead of the pull command, and it would’ve pulled the image from Docker Hub before running. But sometimes, you might want to just download an image, then run it later — maybe after setting up other components. Note: You can also see a container’s ports in the PORTS column of the docker ps output. It tried but failed to load data from a JSON file, then started listening on localhost:8080. Notice you didn’t get the Unix shell prompt back — this process is running in the foreground, and hasn’t exited. Open a browser at localhost:8080 — nope, “Can’t Connect to the Server”. What’s happening? The container exposes port 8080 in its own environment, but you must publish this port to a port on the host system, to see what’s there. First, get rid of this try-out container: In your Docker cleanup window, run a command to find the container’s ID, stop the container, then remove it. Because there’s only one container running, you can use a command, with two levels of $() nesting, that stops and removes all running containers. Try to work this out on your own before you check the solution below. The -p option, short for --publish, maps the really local localhost:80 to the container’s 8080 port. The --name option specifies the container name. The -d option, short for --detach, runs the container process in the background, so you get the Unix shell prompt back right away. In the browser, open localhost:90 to see the same welcome page. This time, the container is running in the foreground — you didn’t use the -d option, so you didn’t get the Unix shell prompt back. Also, the --rm option means the container will be removed when you stop it. It might take several seconds before it echoes kitura2, and the Unix shell prompt returns in your Docker run window. When the Unix shell prompt returns, refresh the localhost:80 page — it won’t load, because you stopped the container process. Refresh the localhost:80 page — this time it works! Clean up: Close the browser windows. Stop and remove the container. Note that you can’t remove a running container unless you use force. In this section, you’ll first run a database app in a container, accessed by a web app running on the host system. 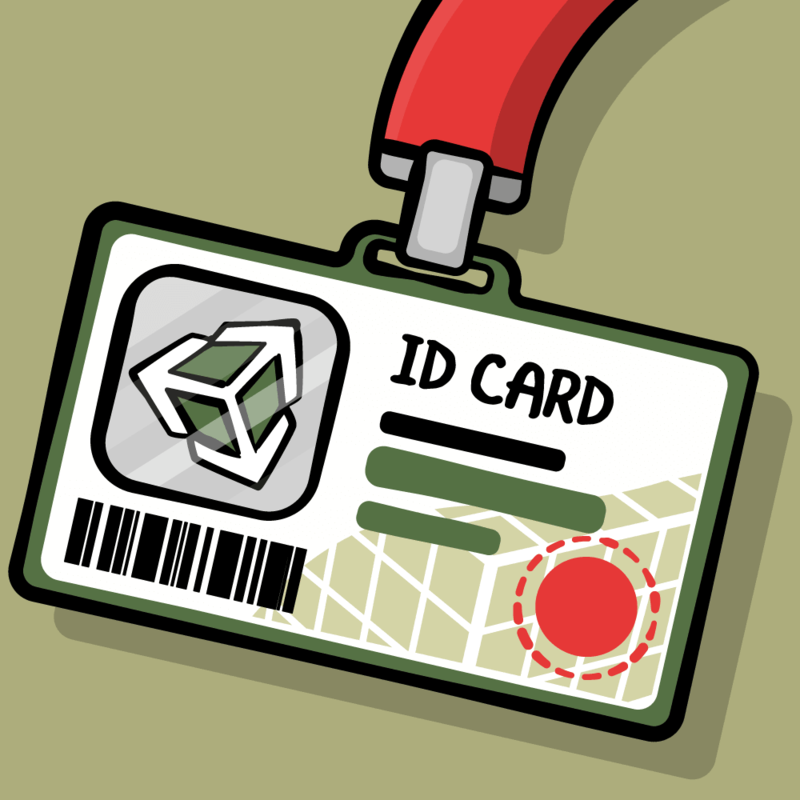 You’ll need to publish the database app’s port, so the web app can access it. If you want to run the web app on multiple ports, it’s easier if it runs in a container, too. But you’ll have to do some extra work to give the web app access to the database app. Web apps usually store data in a database app, like PostgreSQL or CouchDB. Running the database app in Docker containers lets you avoid version problems or test different versions or user types. The CouchDB image always exposes port 5984. You publish this to a local host port number so the web server app can access it. 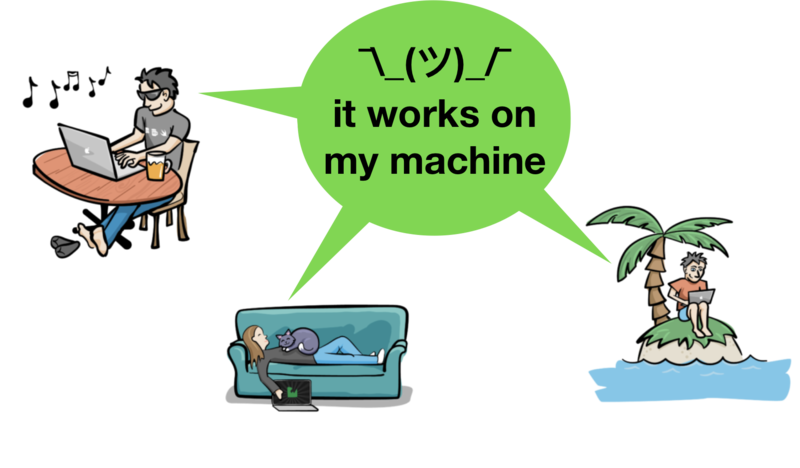 While you wait for CouchDB, build a web server app that uses it. Don’t worry — it’s just a couple of Unix commands! Note: You’ll get some deprecation warnings as the app builds. Ignore them. without a username or password. The last line of the output says it’s “listening on port 8080”, so open localhost:8080 in a browser to see the Kitura welcome page. 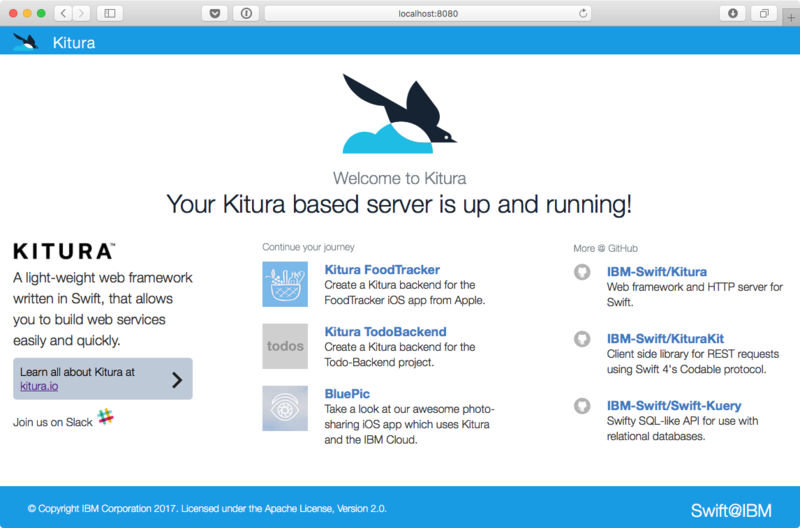 Note: EmojiJournalServer is the sample web server app from our free video course Server Side Swift with Kitura. I’ve edited it a little, so it works in a Docker container. This web server app is running on your host system, not in a Docker container. To run another server alongside, you must either edit and rebuild the Xcode project to expose a different port, or run the server in a Docker container. This is a Docker tutorial, so of course, you’re going to do the second thing! Press Control-C in the EmojiJournalServer terminal window, to stop the server. The EmojiJournalServer folder also contains Dockerfile, Dockerfile-tools and runDocker.sh files. You’re just looking at Dockerfile and runDocker.sh. Dockerfile-tools looks similar to Dockerfile. 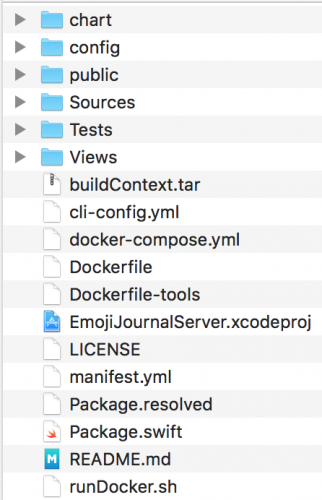 These files contain instructions for building the Docker images needed to run EmojiJournalServer. The runDocker.sh shell script contains the commands to build these images and run the app. This output looks similar to what you got from the .build/debug/EmojiJournalServer command, but “Database does not exist” seems wrong — why doesn’t it see the database you already created? And it gets worse, with “Could not create new database” and “journal entry routes not created”! The IP address of couchdb is 172.17.0.2 in my output but might be different on your Mac or the next time I run CouchDB. You could edit and rebuild the web app to access CouchDB’s 5984 port as 172.17.0.2, but the IP address will probably be different when you run it. Ideally, you want the web app to automatically discover CouchDB’s IP address, whatever it is this time, from the host name couchdb. The trick is to create a user-defined bridge network, then connect both containers to this network. Then each container can use the other’s host name to access its ports. An additional benefit is that entities outside the network cannot access these ports. 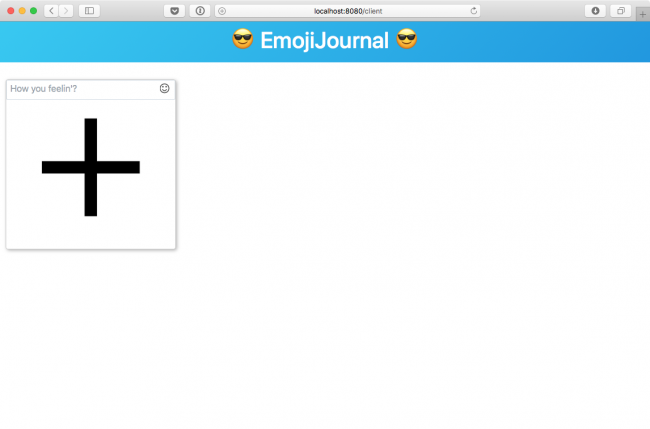 You’ve created a Docker network named emoji-net. You’ve started a CouchDB container on this network. You don’t need to publish a local port for CouchDB — the web app will run on the same network, so it will be able to see the port that CouchDB exposes to the network. -v $PWD:/root/project mounts the current directory in the container as /root/project — it bind your current directory to /root/project inside the container, so changes to the host files affect the container’s files and vice versa. Mounting Volumes has its own section later in this tutorial. -w /root/project sets the container’s working directory to /root/project. -w is short for --workdir. 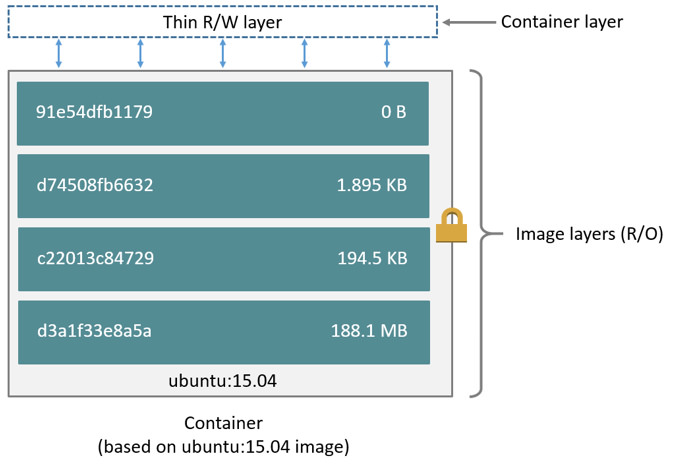 Note: The instructions for some Docker Hub images tell you to use --link to connect containers. Docker documentation says it’s “a legacy feature [that] may eventually be removed”, and you should use user-defined networks and --network. The server is running in the foreground — press Control-P-Q to detach this process without stopping it. The Unix shell prompt returns. Note: The CouchDB container must be named “couchdb”, because this is what EmojiJournalServer expects. It’s hard-coded in Application.swift as the host name in the connectionProperties property of the App class. 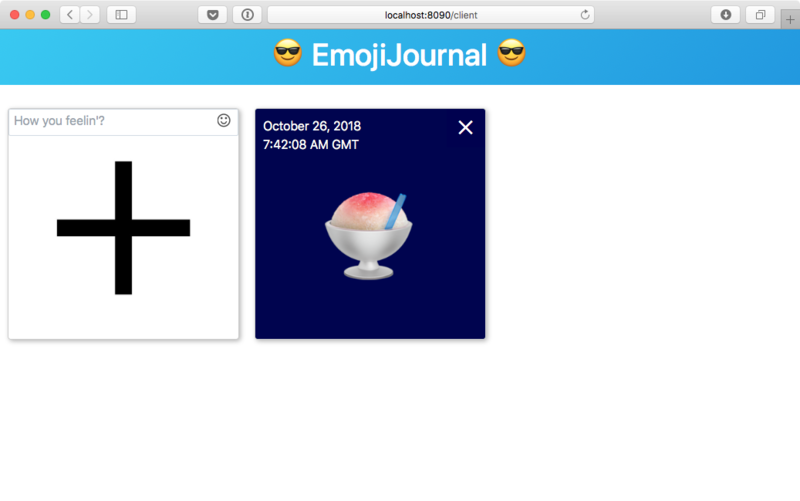 Open localhost:8070/client in a browser — it displays the same emoji you added on port 8090. Add another emoji on port 8070, then refresh port 8090 to see it appear. Think back to the CouchDB container you ran on the default bridge network — you added emoji to it. Then you stopped and removed it, and later created another CouchDB container on the emoji-net network. Starting EmojiJournalServer on this network created a new empty journal entries database. Then starting a second EmojiJournalServer on the same network used the existing database. If you run another CouchDB container, it has no access to this CouchDB container’s databases. Removing a CouchDB container also removes its databases. But you usually want to keep the data in your databases, between stopping and starting CouchDB containers. And you might want to share one container’s databases with another container. As you’d expect, Docker has ways to let you do this! Clean up: In the Docker run terminal window, enter exit at the bash prompt. Stop and remove all the containers. You’ll often want to share files or directories between your host machine and containers. Data in databases shouldn’t disappear when you stop and remove a container. It’s also convenient to share databases between different versions of apps, or different containers running the same database app. You might want to supply configuration files to a database app or training data to a machine learning app, when they’re running in containers. You’ll learn how to do these things in this section. To store the database on your local host system, so it persists and can be accessed by other containers, you’ll create a volume in Docker’s storage directory when you start the CouchDB container. Note: In the --mount value, don’t put spaces around the = signs or after the comma. The first time you run this command, it creates couchdbVolume in Docker’s storage directory on your host system, then copies the contents of the container’s /opt/couchdb/data directory into couchdbVolume. The container then mounts and uses couchdbVolume to store its databases. Use the Finder ▸ Go ▸ Go to Folder… menu item to look at the mountpoint directory … well, you can try to look at it — it’s not there! Docker’s storage directory actually lives in, and is managed by, the Docker engine. You’re not meant to access it directly on the host file system. You can only access it by mounting it in a Docker container. 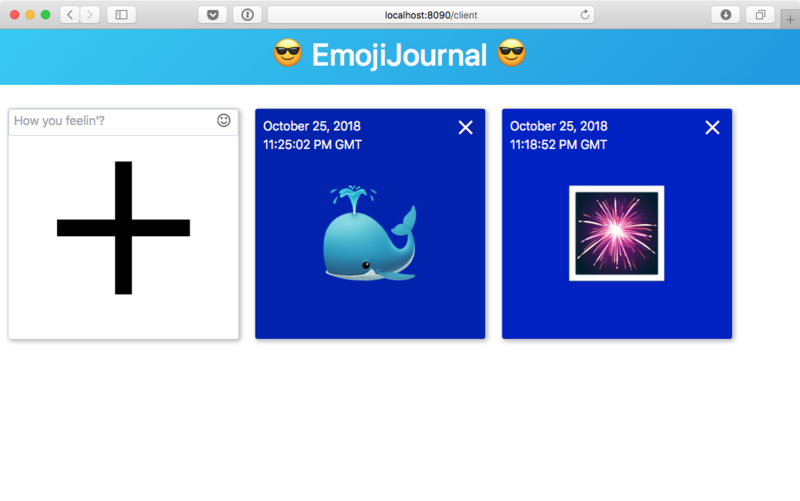 Now, to demonstrate that the emoji database persisted after you removed the CouchDB container: Rerun the CouchDB command in your Docker run terminal window, and the EmojiJournalServer command in your EmojiJournalServer terminal window, then refresh localhost:8090/client — this time, you didn’t lose your emoji! Because couchdbVolume already exists, the CouchDB container just mounted it, exposing the databases already stored there to the EmojiJournalServer container, which found and loaded the journal entries database created by the previous EmojiJournalServer container. You created a volume for CouchDB running on the emoji-net network. You’ve stopped and removed that CouchDB container, but the volume remains. You can reuse this volume for a CouchDB container running on the default network, effectively sharing its databases with another container. 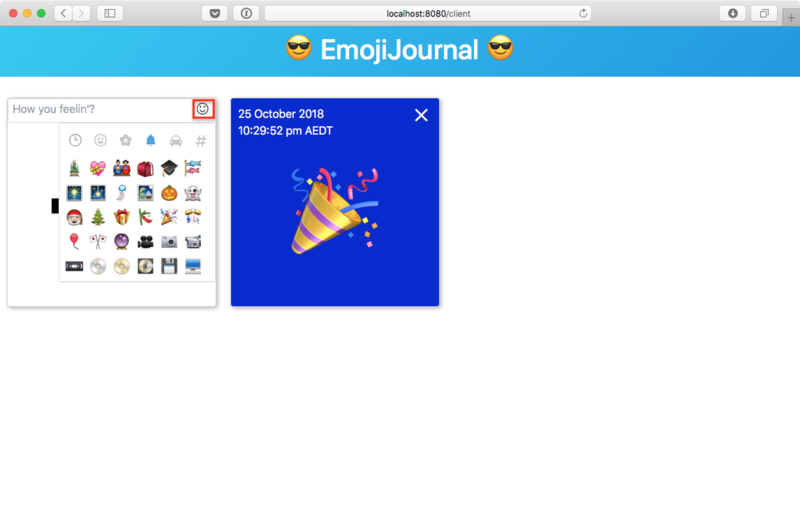 To demonstrate this, mount couchdbVolume in a CouchDB container running on the default bridge network, so EmojiJournalServer on the host can access the saved journal entries database. In your EmojiJournalServer terminal window, press Control-C to stop this EmojiJournalServer. Close the browser window. The command that runs EmojiJournalServer in a container has a -v $PWD:/root/project option that mounts the EmojiJournalServer directory as /root/project in the container. This section demonstrates that changes to the host files affect the container’s files, and vice versa. In Finder, the file disappears. That’s how easy it is to connect a local directory to a container — changes in one place affect the other! Cleanup: Stop and remove the container. 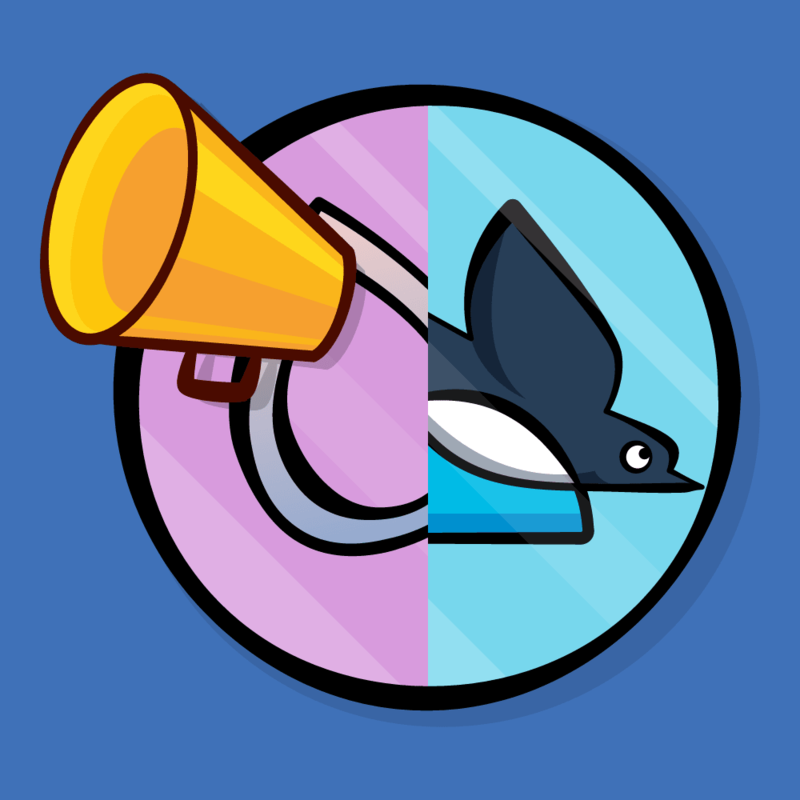 You’ve now seen two different ways to mount host directories in a container: couchdbVolume is a volume, while the EmojiJournalServer directory is a bind mount. The main differences between a volume and a bind mount are where it lives on the host file system, and whether you can access it directly through the host file system. 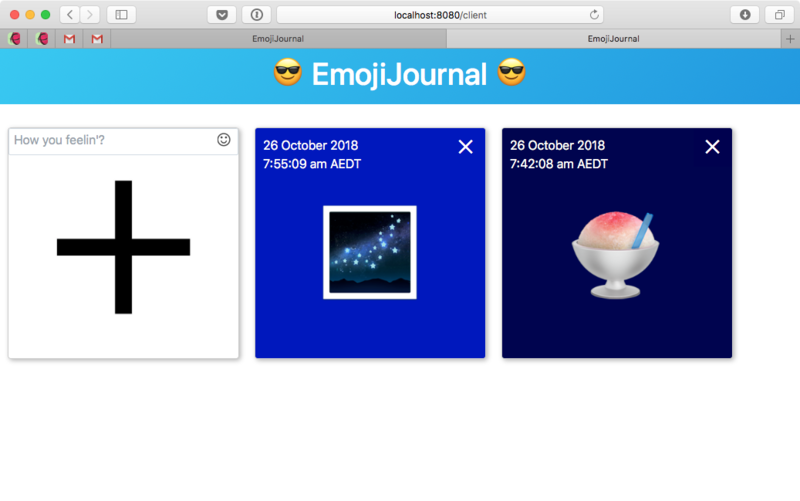 You bind-mount a specific path on your local system — like the EmojiJournalServer folder — to a specific path in the container — /root/project. You can interact directly with the local directory and changes will appear in the container. Likewise, changes made by the container appear in Finder. You create a volume by specifying a name, like couchdbVolume, in either a docker run or a docker volume create command. The volume lives in Docker’s storage directory, in the Docker engine on your local system. You cannot interact directly with the contents of this directory. You can mount it into containers, and you can inspect its metadata or remove it. Docker manages reading and writing files in the volume. Another big difference is what happens when you expose an existing container directory. If you bind-mount a local directory to an existing container directory, what’s in the local directory obscures the container directory’s contents — this is what happens if you bind-mount your local couchdb-config directory to the CouchDB container’s local.d directory. You effectively overwrite the container directory. Don’t worry, the original directory is still in the read-only image! If you expose a container directory as a volume, its contents are copied into the volume on the host. This is what happened when you created couchdbVolume with the CouchDB container’s /opt/couchdb/data directory as its target. There are also two different options you can use to mount volumes or bind-mount local directories. They do the same thing — they just use different syntax. The --mount option is newer than --volume. It uses comma-separated key=value pairs, and the order of the keys doesn’t matter. This option doesn’t have a shorthand version. The --volume flag, shorthand -v, has three colon-separated fields: the order matters, but you have to remember, or look up, the meaning of each field. Docker documentation recommends using the --mount option instead of the -v option: it’s more verbose, but that makes it easier to understand and remember. Note: type=volume is the default. Note: The first field of the -v option is a name, not a path, so Docker creates a volume, not a bind mount. Both commands copy /Kitura-Starter‘s contents into a volume named KituraVolume. The Kitura container then mounts and uses KituraVolume. You can mount KituraVolume in other containers, to give them access to its contents. If you use -v or --volume to bind-mount a file or directory that does not yet exist on the Docker host, -v creates the endpoint for you. It is always created as a directory. If you use --mount to bind-mount a file or directory that does not yet exist on the Docker host, Docker does not automatically create it for you, but generates an error. Note that if you use -v to bind-mount a directory that doesn’t exist on the host, to a directory that exists in the container, it will be created as an empty directory on the host, so its emptiness will obscure the original contents in the container. 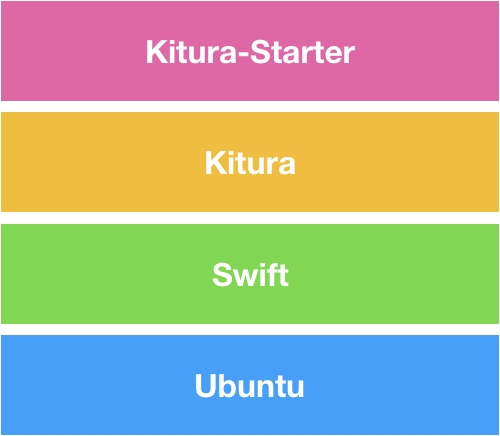 For example, if you try to copy the Kitura-Starter directory from the container to your local file system with -v $PWD/kitura-dir:Kitura-Starter, all you’ll get are empty directories in both your file system and the container. You’ve seen a lot of Docker commands in this tutorial! Below is a list of them. Terms in square brackets, like [image], are placeholders for specific names or IDs. If the container is in the foreground because you ran docker run -it ... bash, exit at the bash shell prompt stops the container. If the container is in the foreground because you ran docker exec -it ... bash, exit at the bash shell prompt exits the bash shell but doesn’t stop the container. Docker’s documentation is comprehensive and very helpful. You can find lots of Docker cheat sheets online, like github.com/wsargent/docker-cheat-sheet and devhints.io/docker. Awesome Docker is a curated list of Docker resources and projects. 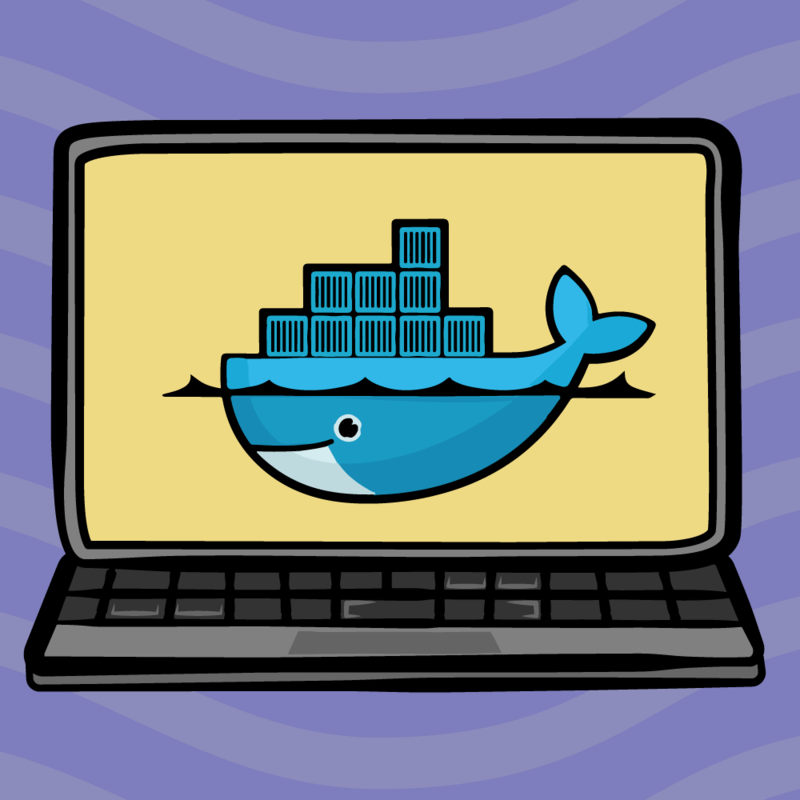 We hope you enjoyed this tutorial on Docker and, if you have any questions or comments, please join the forum discussion below!